When it comes to optimising productivity at home or work, our Microsoft keyboard range will instantly improve and enhance your computing experience. 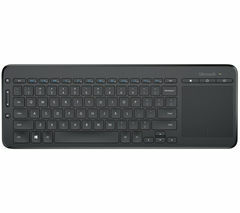 Highly functional and accessible, our high quality range of Microsoft keyboards feature a whole host of convenient and necessary functions such as play/pause, video playback, exceptional volume controllers and a handy calculator! But that’s not all, to optimise comfort and productivity, Microsoft has focused on creating ergonomic designs that help to improve natural wrist position, meaning you will be able to use your keyboard for longer without becoming uncomfortable. 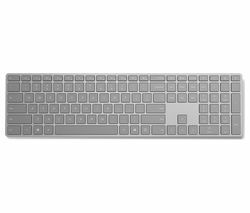 Featuring slim, glossy designs and many space saving aesthetics, Microsoft keyboards are sure to become a welcome addition to any office or home office space, allowing you to enjoy exceptional quality, function, and design. Other models available in this range also boast an integrated multi-touch trackpad, giving you total control of your Microsoft PC. This means you will be able to navigate your photos, documents and music conveniently without the need of a mouse. Microsoft keyboards have been expertly built with longevity and durability in mind, so they’re robust and sturdy enough to survive accidental falls when you are using it. Make sure you check out our full range of keyboards, including our selection of Advent, Goji, Roccat, Sandstrom, Logitech keyboards.